Chemical weapons watchdog confirms sarin nerve gas was used in April 4 attack, stops short of naming the responsible party. An investigation by the international chemical weapons watchdog confirmed on Friday that sarin nerve gas was used in a deadly April 4 attack in Syria, The Associated Press reported. 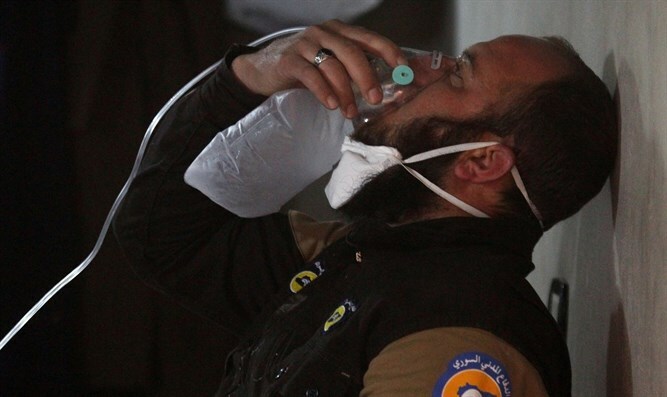 At the same time, the Organization for the Prohibition of Chemical Weapons (OPCW) stopped short of saying who was responsible for the attack on Khan Sheikhun in Syria’s Idlib province. The April 4 attack left more than 90 people dead, including women and children, and sparked outrage around the world. The U.S. blamed the Syrian military for the attack and launched a punitive strike days later. A government source in Washington also said days after the attack that the U.S. believes sarin was used and that the attack was "almost certainly" carried out by forces loyal to Syrian President Bashar Al-Assad. Assad has denied using chemical weapons and has even claimed that the Khan Sheikhun attack was fabricated by the United States. The findings of the investigation released Friday will be used by a joint UN-OPCW investigation team working to assess who was responsible for the attack. The team is expected to issue its next report around October. The OPCW has scheduled a July 5 meeting of its executive council to discuss the matter, noted AP. The OPCW has determined that civilians in Syria may have been exposed to chemicals even after the Syrian government agreed to a 2013 deal, brokered by the U.S. and Russia, to surrender its chemical weapons. Human Rights Watch released a report in May alleging that Khan Sheikhun was part of a wider pattern of chemical weapon use by Syrian government forces, including three other attacks involving nerve agents since December. Assad’s close ally, Russian President Vladimir Putin, has stated that he believed the attack was “a provocation” staged “by people who wanted to blame” Assad.